The accessibility to all areas of the machine for the diamond wires replacements or for changing the diamond wires cutting set up, is fast and completely safe, through PREMIA multi-wires access stairs and protection, respecting the most rigid international safety regulations. A mono-block structure supported by four columns is foreseen for models that exceed 36 diamond wires. and fast in replacing and re-positioning the diamond wires thanks to a new advanced system which has studied and designed by QTEQ. Designed with an optimized triangular diamond wires loop circuit system, combined with the big diameter of the wire pulleys and the ability to be optimized to cut with any diameter of diamond wire, QTEQ PREMIA multi-wires minimize the stress on the diamond wires and are able to reach diamond wires yields (m2 cut per linear meter of wire) which were until now never achieved! Thanks to the sides pulleys of 1.500 mm diameter, the 1.000 mm diameter of the tensioning pulleys, the 800 mm diameter of the guiding wire drums, QTEQ PREMIA multi-wire can optimize diamond wires life (m2/m)(m2/m), cutting accuracy (minimum tolerance) and cutting performances (productivity in m2/hour) of the utilized diamond wires. The PREMIA pneumatic tensioning and cutting management system allows to have at all times an optimal diamond tool pressure on the materials to cut, avoiding the typical possible problems of abnormal wear, “ovalizations” (diamond beads loss of their optimal cylindrical shape), cutting deviations and diamond wires breakages. The new generation of multi-wire PREMIA is the highest expression of absolute innovation, associated with the revolutionary 4,3 mm diamond wire exclusively produced by QTEQ. The advantage is expressed in more m2 produced per m3 of cut stone, as high as 40 m2 of 20mm thick slabs per each cubic meter of block, a goal never achieved until today. Cutting performances and competitive costs are completely guaranteed by QTEQ. REMARKABLE INCREASE OF PRODUCTIVITYOF LABS PAR M3 OF CUT BLOCKS. 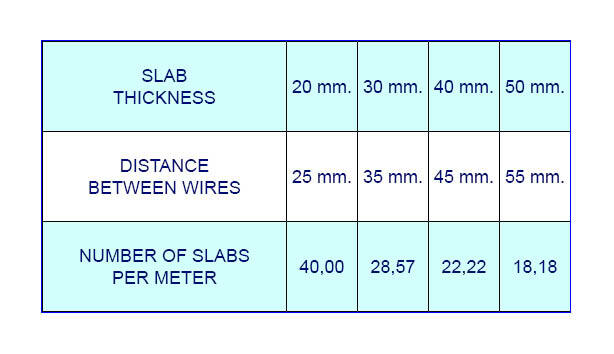 of 4,3 mm diameter is the solution offer the highest advantage.